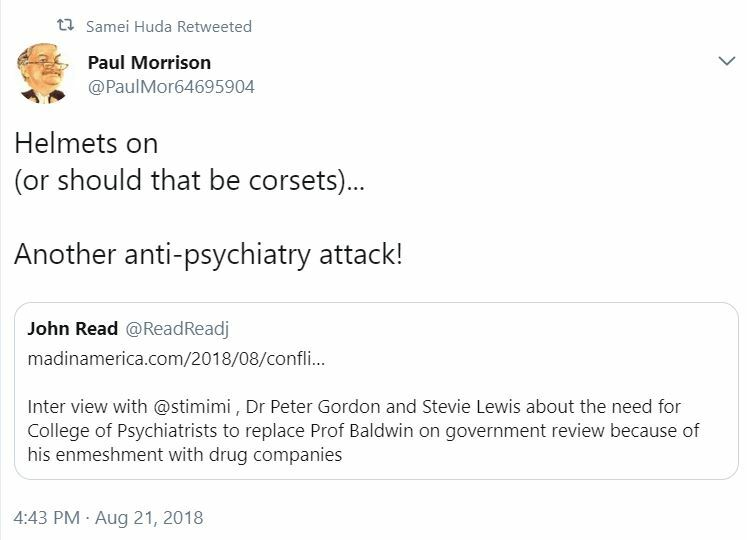 I was recently interviewed to be part of this MIA podcast that considered financial conflicts of interest in relation to British Psychiatry and in particular in relation to expert contributions made to the on-going Public Health England review into prescribed drug dependence and withdrawal. For the record I am not a critical psychiatrist nor an anti-psychiatrist nor a scientologist. I am simply aware that any intervention can bring about a range of consequences and believe that it is a professional responsibility and scientific imperative to talk about these. You have kindly confirmed that you have not declared on ‘Disclosure UK’ (ABPI) the competing financial interests with the following companies: Valeant, Otsuka, GW Pharmaceuticals, Oxford Pharmagenesis, Pfizer and Boehringer Ingelheim. My position is that our profession does itself no good by failing to acknowledge evidence which has repeatedly established that competing financial interests can result in worse treatment for patients. There are of course competing interests other than financial but that is no reason to fail to address this one.